Our tour guide, whose name now escapes me – Yannis? – let us have lunch at Monastiraki. Yes, it’s very touristy, but we were hot, hungry, and short on time. We both had a souvlaki pita at Thanassis and I’d have to say, in retrospect, it was probably one of the best things I ate in Greece. 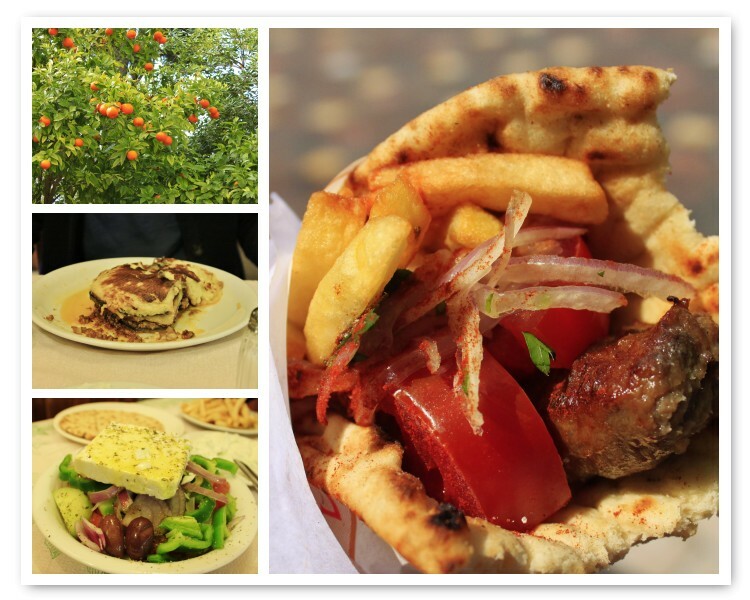 I had some pretty amazing food but I can still remember the juicy texture of the souvlaki after 4 months. YUM. Hands down, best investment of 2€ the whole day. 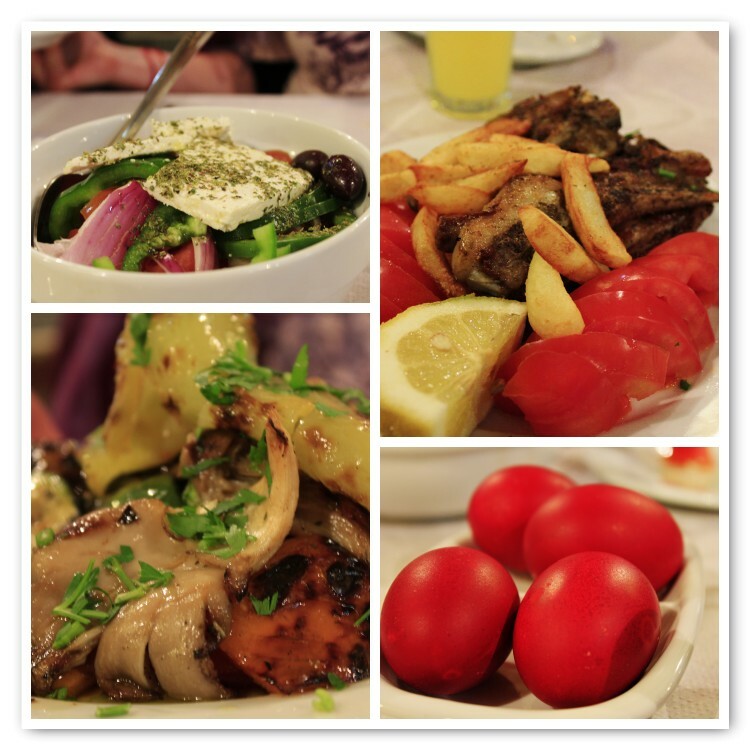 We couldn’t get enough of it, so we went back for dinner and had moussaka and a large Greek salad with pita and tzatziki. Everything was fresh and fantastic, and the salad had the most generous piece of cheese I’ve ever seen on any salad. Two days later, we boarded a late afternoon ferry for the island of Naxos. I had pretty low expectations, I must admit – I’d never heard of it. Now that I’m wiser, I can highly, highly, HIGHLY recommend that you visit! What an amazing place! We arrived shortly before midnight and people running off the ferry and whisked away into cars headed to (orthodox) Easter midnight mass. Firecrackers everywhere! Our driver from A1 Soula Hotel dropped us off at his church (so nice of him!) so we got to watch the festivities for a bit. The next day was Easter Sunday, so I woke up with absolute determination that I was going to have roasted lamb for dinner. We woke up bright and early on Easter Sunday and took a walk along the St. George Beach and in town. Somewhere along the way, we ran into the lovely Sunni, whom we’d met the night before because we were picked up at the same time from the ferry. 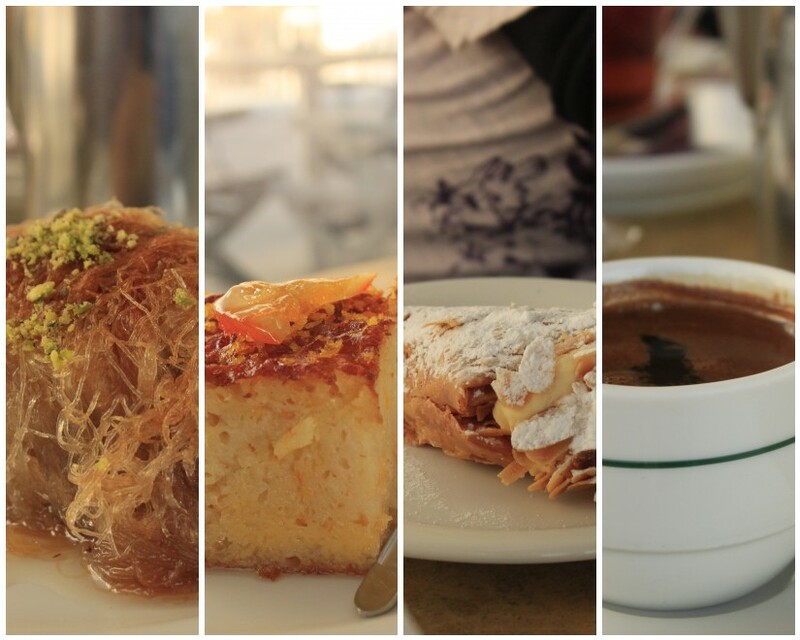 After a full-day photo tour of the island, we sat down for coffee at one of the cafes along the harbor and indulged in some dessert – kadaifi, moist orange cake, and a cream horn. We later met Jeff (?) from the States and the four of us went to dinner together. Our server was a bit standoffish, but the owner/promoter was really charming and I’d promised him earlier that we’d go back and try his roasted lamb. Joanne and I both had it, Sunni had roasted vegetables (a-MAZ-ing), and Jeff had a large salad. The lamb was crispy, fatty, and just…fantastic. They even gave us four red eggs – you’re supposed to knock your egg against everyone else’s and the last person with an intact egg wins. Sadly, I didn’t get a chance to try the local liquer, kitron. The next morning saw us off to Santorini, where there was more souvlaki-ing at Lucky’s, along the main boulevard through Fira, ice cream waffles at Perissa beach, and a nice dinner at Mama’s House – stuffed peppers and catch of the day. A sailing trip to the volcano took us out to Restaurant Tonia on the island of Therasia before we headed off to Crete. The ferry ride from Santorini to Crete was by far the most horrifying boat ride I have ever been on. It was even worse than the sometimes-sketchy ferry ride between Hong Kong and Macau, where the ferry tends to skip over the waves. No, this was probably 100x worse. There’s nothing like the feeling of dread when you see massive 4 m waves rolling toward your boat as you’re trying to navigate through a storm – yay, window seat! Now, the Greeks have been sailing for millennia, so I figured they wouldn’t have tried to sail through this thing if they thought it was dangerous…but I couldn’t help feeling that there was a very real chance we could all drown in the Aegean Sea. 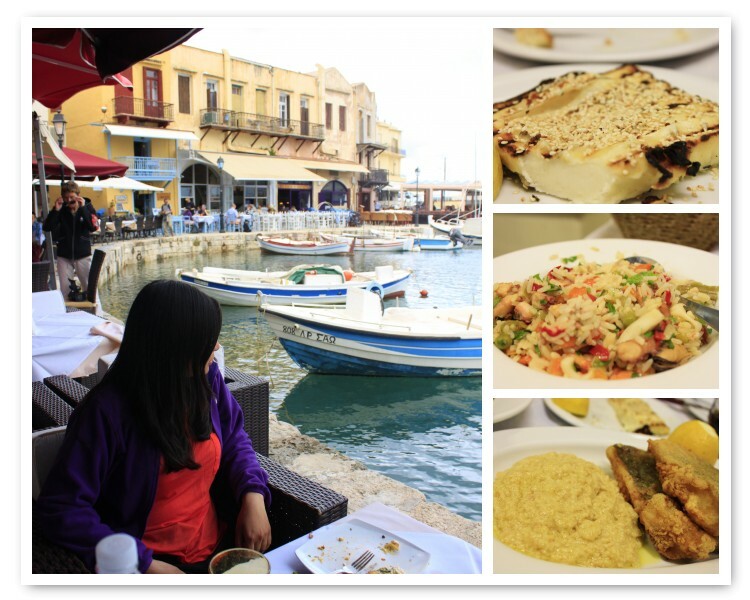 Needless to say, we were in no mood to eat when we arrived in Heraklion. Our appetites returned the next day and we went out for lunch at Mouragio Maria in Rethymno, which I noticed actually has a lot of bad reviews online. The waiter in front is really slimy, so I can relate a bit, but since it was off-season, they didn’t try to pressure us into having fish (though they did lie about the free drinks – good thing we didn’t order anything other than the one bottle of water) and let us sit there for as long as we wanted. We had a Cretian salad, stuffed peppers, and meatballs, and the bill came out to be 40-50€, I think. Pricey, for sure, but it was worth it for the view. Would I go again, though? Probably not. We were on the overnight ferry back to Athens, which was a relatively painless night, and spent our last day in Greece eating more souvlaki at Othanassis, running into our Argentinian friends (whom we’d met by chance twice on two different islands on the trip), and having dinner at Oinomageirio to Paradosiakό in Plaka. 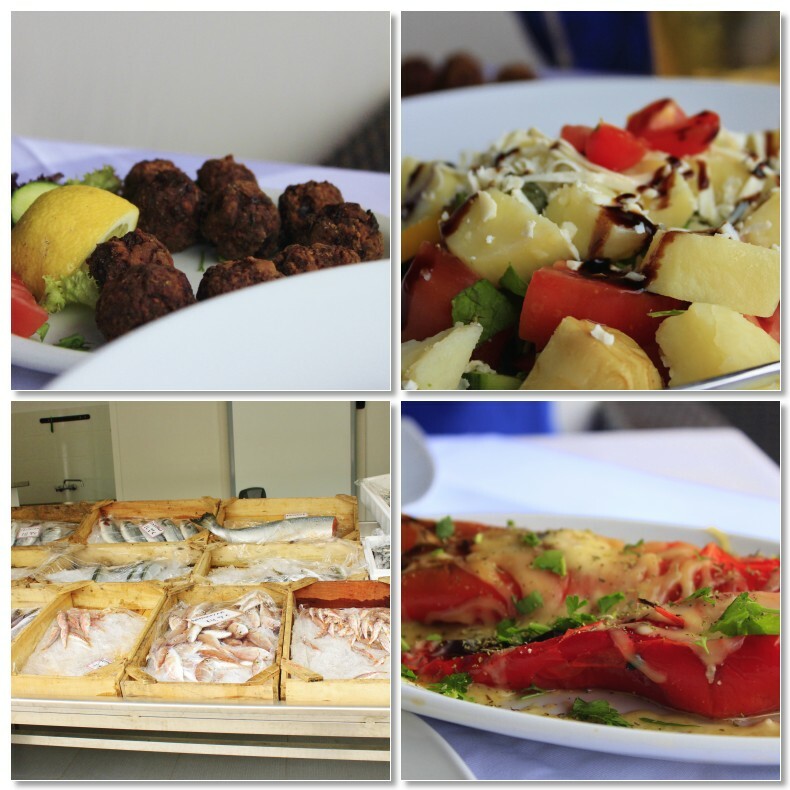 What an amazing end to the trip – grilled halloumi, seafood risotto and deep-fried fish with roasted garlic spread. Highly recommend this place! Were my expectations of Greece fulfilled? It’s a hearty YES from me. Friends, do yourself (and the Greeks, given the current economic situation) a favour and book your next vacation to Greece. 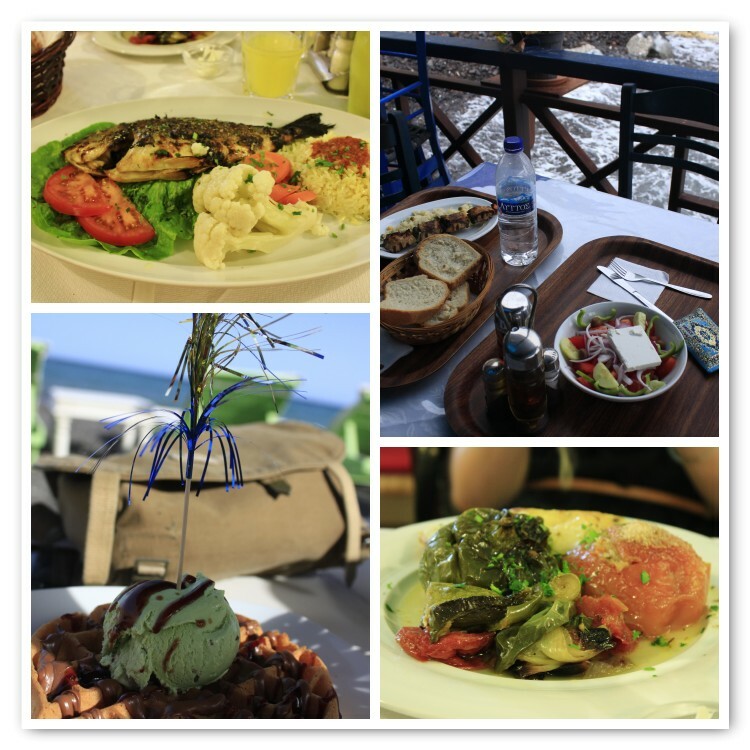 If you’re not dazzled by the crystal clear blue seas and friendly people, you can always occupy yourself with ouzo and wonderful food.